Brief Synopsis – A recently divorced violinist takes a job teaching underprivileged children in Harlem how to play the instrument. My Take on it – This is a film that I heard about many years ago, but never got around to seeing until now. The story told here is quite an inspirational one and it might be hard to believe such a story without knowing that this is based on a true event. I’ve never been the biggest fan of Meryl Steep, but she is great here and I loved the way that she was able to transform her character from being the kind of teacher most kids wouldn’t be that appreciative of into a mentor and role model for thousands. The fact that so many of the real people who were part of the actual event that this film tells the story of were willing to play themselves in the film says so much about the importance of the message of this film and it’s story. There were lots of scenes in this film that reminded me of another film (one of my favorites) about a music teacher and that film is Mr. Holland’s Opus (1995). Bottom Line – Such an inspirational story that would be hard to actually believe if it hadn’t really happened because it sounds too much like a fantasy. 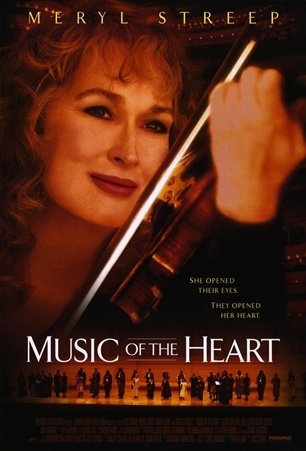 Streep is great in the title role and although, her character at the start doesn’t come across as the kind of teacher many students would appreciate, she evolves through the course of the film. The fact that so many of the real musicians who took part in this film’s story agree to play themselves in the film says so much about how important of a story this film tells. Many of the scenes in the film reminded me of one of my favorite films about teachers which also happens to be about one who teaches music; Mr. Holland’s Opus (1995). Recommended!